The starting step of a flight of stairs that quite often is a feature step wider than the rest. In shape it has one or both ends in the shape of a scroll or spiral. For this reason sometimes called a Scroll Step. A lot of stairs in public building have the bottom few steps made wider and in some manner curved to make the entry to the stair look more imposing and attractive, or in some cases to give access to the stair from the sides. These are sometimes referred to as the curtail steps. The word curtail meaning to stop or cut short. 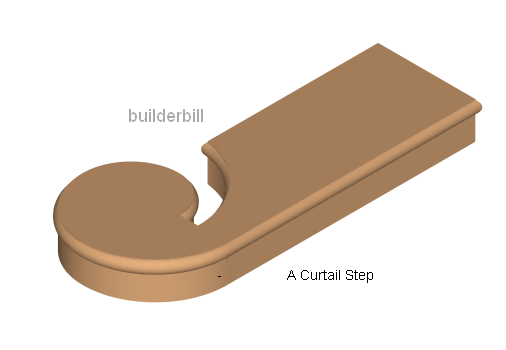 However there is an older and far more specific step that is called a Curtail or Scroll Step. The reason being that it mirrors the design of the handrail scroll that may be above it.